The town of Lafitte near the Lafitte National Historical Park just south of New Orleans holds an annual Iris Festival when the swamps explode with thousands of blue iris blossoms. 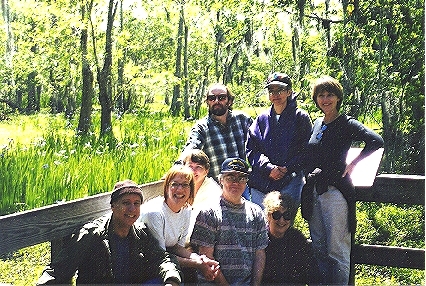 This photo shows a few members of Blue Iris Sangha who took a walk in Lafitte National Park at Festival time in Spring 1999 to admire the irises, absorb the quiet wisdom of the swamps, and enjoy being together. There are many miles of board walks through the swamps maintained by the National Park Service so that people can visit without being destructive. The observation deck on which the group is resting overlooks a huge and ancient cypress that is just out of view to the left. Left to right standing: Alex, Cathy, and Phyllis; sitting: Dewain, Kirsten, Mary Ann, David, and Sue. Scores of irises can be glimpsed growing out of the swamp around and among the trees in the upper left quadrant of the picture. Photo by Danny Smith who also prepared the picnic meal we enjoyed together in the Park.